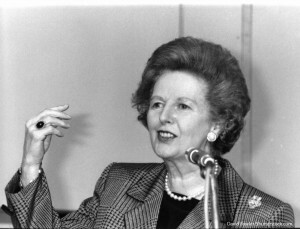 Margaret Thatcher- "The problem with socialism is that eventually you run out of other people´s money." Socialists cry “Power to the people”, and raise the clenched fist as they say it. We all know what they really mean—power over people, power to the State. My policies are based not on some economics theory, but on things I and millions like me were brought up with: an honest day’s work for an honest day’s pay; live within your means; put by a nest egg for a rainy day; pay your bills on time; support the police. The problem with socialism is that eventually you run out of other people´s money. Pennies don’t fall from heaven – they have to be earned here on earth. It pays to know the enemy – not least because at some time you may have the opportunity to turn him into a friend. No one would remember the Good Samaritan if he’d only had good intentions; he had money as well. To wear your heart on your sleeve isn’t a very good plan; you should wear it inside, where it functions best. Popular capitalism is nothing less than a crusade to enfranchise the many in the economic life of the nation.